Here it is, a gluten-free version of our 2015 Recipe of the Year. 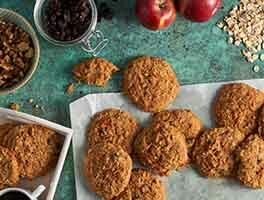 These cookies are tender and mildly chewy, packed with chips, and go beyond the standard chocolate chip cookie with the addition of nutty tasting oats. 13 mins. to 14 mins. 28 mins. to 39 mins. Add the egg and vanilla, beating to combine. Whisk together the flour, oats, baking powder, baking soda, xanthan gum, and salt, and add to the butter mixture in the bowl. Scoop the dough by the teaspoonful onto the prepared baking sheets; a teaspoon cookie scoop works well here. Leave about 1 1/2" between cookies. 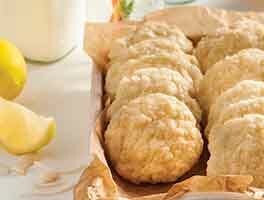 Bake the cookies for 13 to 14 minutes, until they're a light golden brown, with slightly darker edges. Their middles may still look a tiny bit shiny; that's OK, they'll continue to bake as they cool on the pan. Yield: about 56 small (2") cookies. 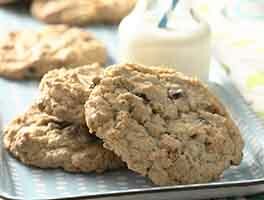 Lovely cookies, bake nice, chewy and crisp in all the right ways. We are new to GF and we are doing Dairy free too, so while I followed the recipe, I did substitute Earth Balance for the Butter. I got a good vehicle for chocolate. The dough itself isn't particularly tasty (likely better with real butter). I think next time I'll up the Oats as many others have done for more Oaty flavor. As my palate adjusts to GF maybe I'll appreciate the flavors of the dough. Made this twice now and will do so again! I doubled the oatmeal (to 1 cup) and reduced chocolate chips to 1/2 cup and added about 2/3 cup chopped pecans. First time they were a little too chocolate for me. Very good now! These cookies are so good!! But I like bigger cookies. I used a tablespoon of dough each and it yielded 24 cookies. I would definitely double the recipe next time! Excellent cookie great flavor easy to make, nice ratio of chocolate chips to batter. I did use powdered honey instead of white sugar and added crazies with the chocolate chips. Just before making them, lost power during a blizzard so, I baked them in the oven of my wood stove - still turned out great. 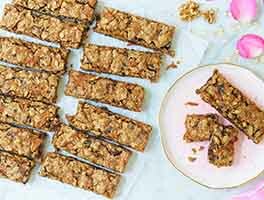 I just made this recipe, substituted 1 cup of raisins instead of chocolate chips and replaced xanthan gum with chia seeds. I also increased the oats to almost 1 cup. 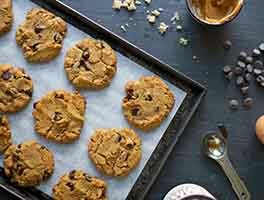 The cookies are chewy and delicious and a huge hit with my kids. I made the recipe as written, using quick muesli. A big hit. They are crisp and hold their texture well for the day or two I had them out on the counter. I froze the remainder and they thawed fine and retained the crispness. I didn't tell my family they were gluten free because I wanted to avoid any possible prejudice. They loved them. The only reason I'm giving these 4 stars instead of 5 is because it's not a true oatmeal cookie recipe (in the traditional sense), which is what I was looking for. I also feel like they would have been pretty boring had I stuck to the recipe. Instead, I added in dried cranberries and slivered almonds in addition to the chocolate chips. They turned out to be absolutely scrumptious. This cookie was DELICIOUS! It tastes so good right out of the oven, and is so crispy! I substituted xanthan gum with chia seeds and it made it so crispy! They are so delicious! 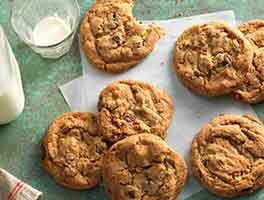 Tip: it's best not to substitute the brown sugar because without it, this would not be a perfect cookie. The only thing was, the oats sank to the bottom of the cookies. I think next time I will put a cup of oats instead of a half cup because they were more like regular choco chip cookies, not oatmeal choco chip cookies. But overall, these were so good! Definitely will try again! Thanks again KAF! These turned out fantastic. I didn't have KAF - I used Trader Joe's GF flower and it came out great! Followed the recipe exactly, but reduced the chips to 1 cup since I had the jumbo chips.